Two nights ago we hosted a cheesecake party in our home for all of the new BFA staff. I made 4 different kinds of cheesecakes as well as a strawberry pie. We had a very full house - 29 people altogether - but a good time was had by all (we hope!). I have posted this aerial photo of BFA before (see below). I am posting it today so you can look for BFA in these aerials of our town. In the top photo you'll see BFA's campus towards the left side of the picture (look for the red roof right beside the large white roof). In the last picture BFA is in the bottom right-hand corner. Today was the first day of the brand new Christliche Schule Kandern (Christian School Kandern). As far as we know, CSK is the first Christian bilingual school in Germany. 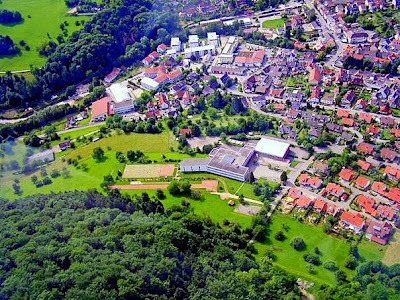 This school is a partnership ministry between Black Forest Academy and the Freie Evangelische Schule Loerrach a large German Christian School near us. The new first graders below, 24 in total, are all dressed up for the first day of school. They are holding their Schuletuetes (a bag with special gifts for the first day of school) in their arms. In Germany, the whole family comes out to celebrate the first day of first grade. Parents, grandparents, aunts and uncle all come to wish their children well on the first day of school. More first graders of the brand new school. History is being made today. The elementary choir of Black Forest Academy sang a song of welcome to the new children. Here are Phil Peters and Tim Shuman handing out new t-shirts to celebrate the new school. Mrs. Schmidt the English teacher is handing out the t-shirts to the first graders. The kids with their new shirts. Here's a picture of the first students of the Christliche Schule Kandern - all first graders. Small beginnings!! Alexander and Micah. Two BFA boys in 3rd and 5th grade. They seem very happy about today's amazing event. They too, got to witness the birth of a new school. Anna-Kate from my small group celebrated her 17th Birthday yesterday. We had a little pre-Birthday party for her at our small group time on Thursday evening. I baked her two cakes - one for Thursday and then one for last night when she invited many of her classmates to a "White Party" where all guests were supposed to wear white. Tim and I were invited to the party. We delivered the cake, stayed for awhile and had a great time with AK's family and her guests. This was a big party! Approximately 30 of her classmates came! Today Tim and I went for a delightful drive (well, the long traffic jam on the way home wasn't so delightful!) along the Alsace wine route in France. "La Rue du Vin" takes you through many quaint towns and villages and of course countless vineyards. Very beautiful and picturesque.